The large, flightless bird native to Australia and New Guinea killed the man Friday on his property near Gainesville, likely using its long claws. It looks like it was accidental. A Southern cassowary courtesy of the San Diego Zoo. It lives in the New Guinea lowland rain forests and is slightly less common in northern Queensland, Australia. 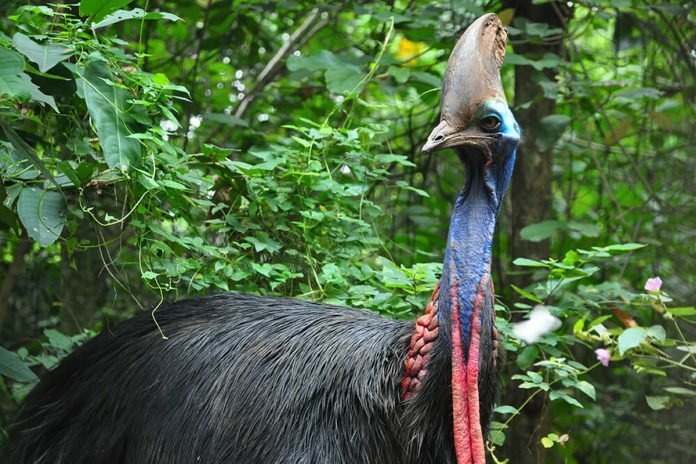 A large, flightless cassowary kills its owner on his property near Gainesville. The bird native to Australia and New Guinea killed the man when it attacked him after he fell, authorities said Saturday. The Alachua County Fire Rescue Department told the Gainesville Sun that a cassowary killed the man Friday, likely using its long claws. The victim, whose name was not released, was apparently breeding the birds, state wildlife officials said. Officials say the breeder did not have a permit to own the animal. Florida Fish and Wildlife Conservation Commission spokeswoman Karen Parker confirmed that 75-year-old Marvin Hajos exercised an exemption in the agency’s captive wildlife rules. Cassowaries are similar to emus and stand up to 6 feet (1.8 meters) tall and weigh up to 130 pounds (60 kilograms), with black body feathers and bright blue heads and necks. The San Diego Zoo’s website calls cassowaries the world’s most dangerous bird with a four-inch (10-centimeter), dagger-like claw on each foot. “The cassowary can slice open any predator or potential threat with a single swift kick. Powerful legs help the cassowary run up to 31 miles per hour (50 kph) through the dense forest underbrush,” the website says. Cassowaries are not raised for food in the U.S., but are sought after by collectors. To get the mandatory permit, the Florida Fish and Wildlife Conservation Commission requires cassowary owners to have “substantial experience” and meet specific cage requirements, spokeswoman Karen Parker told the newspaper. Wildlife officials did not answer phone calls late Saturday and it could not be learned what happened to the bird.